Confusingly for any newcomer to science who is familiar with the internet, scientific journals don't provide open access to papers in general. They restrict access with paywalls and only really publish (in the sense of to make publicly available) a subset of papers. The cost of access is so high that even institutions like Harvard and the UK's Medical Research Council (MRC) cannot afford paying for general access to all the relevant scientific literature. For example, as MRC employees, members of my lab do not have access to the Journal of Neuroscience,because our MRC Unit, the Cognition and Brain Sciences Unit in Cambridge, cannot afford to subscribe to it. 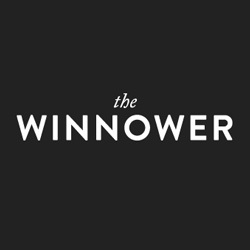 The University of Cambridge pays more than one million pounds in annual subscription fees to Elsevier alone, a single major publishing company, as do several other UK universities. Researchers who are not at well-funded institutions in rich countries are severely restricted in their access to the literature and cannot fully participate in science under the present system. Journals administer peer review and provide pretty layouts and in some cases editing services. Preprints complement journals, enabling us to read about each other's work as soon as it's written up and without paywall restrictions. With the current revival of interest in preprints (check out ASAPbio), more and more scientists choose to post their papers as preprints. All major journals including Nature, Science, and most high-impact field-specific journals support the posting of preprints. Preprint posting is in the interest of journals because they, too, would like to avoid publication of papers with errors and false claims. Moreover, the early availability of the results boosts early citations and thus the journal's impact factor. Check out Wikipedia's useful overview of journal preprint policies. For detailed information on each journal's precise preprint policy, refer to the excellent ROMEO website at the University of Nottingham's SHERPA project on the future of scholarly communication (thanks to Carsten Allefeld for pointing this out). Earlier citation: Preprints grant access to our work earlier, leading to earlier citation. This is beneficial to our near-term citation success, thus improving our bibliometrics and helping our careers - as well as boosting the impact factor of the journal, where the paper appears. My lab came around to routine preprint posting for entirely selfish reasons. Our decision was triggered by an experience that drove home the power of preprints. A competing lab had posted a paper closely related to one of our projects as a preprint. We did not post preprints at the time, but we cited their preprint in the paper on our project. Our paper appeared before theirs in the same journal. Although we were first, by a few months, with a peer-reviewed journal paper, they were first with their preprint. Moreover, our competitors could not cite us, because we had not posted a preprint and their paper had already been finalised when ours appeared. Appropriately, they took precedence in the citation graph - with us citing them, but not vice versa. Posting preprints doesn't only have advantages. It is also risky. What if another group reads the preprint, steals the idea, and publishes it first in a high-impact journal? This could be a personal catastrophe for the first author, with the credit for years of original work diminished to a footnote in the scientific record. Dishonorable scooping of this kind is not unheard of. Even if we believe that our colleagues are all trustworthy and outright stealing is rare, there is a risk of being scooped by honorable competitors. Competing labs are likely to be independently working on related issues. Seeing our preprint might help them improve their ongoing work; and they may not feel the need to cite our preprint for the ideas it provided. Even if our competitors do not take any idea from our preprint, just knowing that our project is ready to enter the year-long (or multiple-year) publication fight might motivate them to accelerate progress with their competing project. This might enable them to publish first in a journal. I expect that as preprints become more widely used, incentives will shift. Preprints will more often be cited, enhancing the preprint-precedence and early-citation benefits. 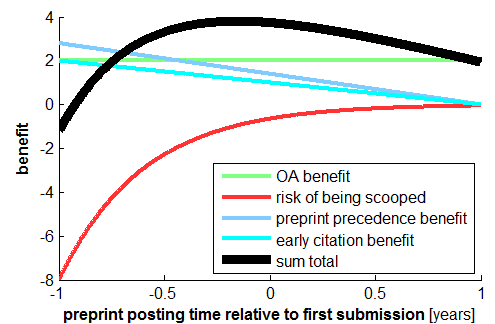 This will shift the selfish scientist's optimal time of preprint posting to an earlier point, where an initial round of responses can help improve the paper before a journal vets it for a place in its pages. For now, we post at the time of the first submission. The key issue is getting funding. The funding agencies like the NIH need to set the rules. Proposal: Funding agencies should require publishing in open access pre-print servers and ban publishing with for-profit publishers like Elsevier. If I have to post to pre-print, worry about others scooping me with what I post there while I'm waiting for the regular journal to publish it, why bother? We need the funding agencies to accept the pre-print servers as the endgame, and not just another thing we have to do. Otherwise it's a non-starter. I agree that funders can help by adding preprint requirements. However, even without such a contribution from the funders, we can change our publishing culture. If you post just before your paper appears in a journal, there is no scooping risk. Let's do this ourselves, instead of relying on others (funders, institutions, publishers) to lead the way. It's the right thing to do, and requires no personal sacrifice. I strongly agree with Niko Kriegeskorte in that the biggest benefit of preprint posting is achieved probably when we do it at the time of first submission. Below is my own experience, before reading this article. Here are the reasons and the experiences so far. and ArXiv from colleagues already, and we are very happy with it. we are very happy with it as well. eLife are totally fine with it. Elsevier could be a potential problem. Thank you so much to sharing this amazing Mind twister video game Junction.If you are still searching to the website where you can play some challenging video game for free of cost then visit this free freecell solitaire and play online with your close friends by inviting them.Thank you so much.